Frack Free Ashfield is working to provide information, discussion and action to help protect our community from the possible side effects of Fracking. Click on our face book link to join us. We will post up to date news about the potential for fracking in this area of Nottinghamshire and aim to create a strong case against these companies moving onto our land. So, what is Fracking and should we be concerned? Fracking has been banned in a number of countries due to concerns over its safety and because of environmental issues that burning these fuels can have. The video below describes how millions of gallons of water are used per drilling well and contaminated with dangerous chemicals. The majority of this fracking fluid is left in the ground though over 30% resurfaces and needs to be disposed of as cheaply and discreetly as possible. This water besides containing fracking chemicals also reappears with increased levels of radiation. Fracking waste was dumped in the Manchester ship canal, though there are now plans to dump at sea. Whilst gas companies say that fracking is safe and effective there is growing evidence from other countries that this is not true. In Holland earthquakes from fracking have caused so many problems that they are now looking to ban it. Long term effects on water supplies and pollution are hard to predict, but the evidence is that the companies will take little responsability if or when things do go wrong. If you are concerned about fracking, then it is a good idea to join a local group and get involved. Opposition comes in many forms from lobbying mps to direct protest at the newly developing gas sites such as Tinker Lane in Nottinghamshire. Whilst many of these sites are currently exploratory, the more opposition they face now the more likely it is we could win the battle of fracking spreading across the country. 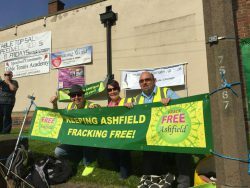 Frack Free Ashfield hold regular meetings. Please feel free to come along and learn more about what we do.